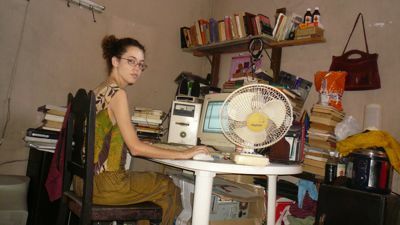 Her first blog palaDeOinDeleite [es]  is also her personal blog and focused on Cuban art, literature, politics, and society. It has evolved into a place to showcase other cultural projects on the island. A second blog is called Cuba Fake News [es] . This site, as the name states, provides bilingual “fake news” about Cuba and receives contributions from a variety of authors. Mónica's third blog is Project Deliz [es] , which provides information about the cultural project, which aims to “build bridges between literature and national and international art, as well as to explore the relationship between art and life.” On the blog, one can also download a copy of the multi-media magazine.